Sun streams in through the north facing floor to ceiling double stacking ranch sliders. The view looking north. In the distance you can see the masts of the super yachts at Silo Marina and the silos of Silo Park in Wynyard Quarter. Enjoy Netflix on the 49" 4K Smart TV. Ample cupboards in the modern black kitchen with engineered stone bench top. "The place was amazing, clean fresh and very new. It was a pad from a designer magazine." - Patrick, June 2017. Plenty of space and light. The hallway leads to laundry, bathroom and bedroom. We've chosen artwork that helps highlight the different zones. Seating for six around the dining table. The super-king size bed (can be split to two long singles on request) and large chest of drawers. Continue watching your Netflix shows from bed with this HD Smart TV. 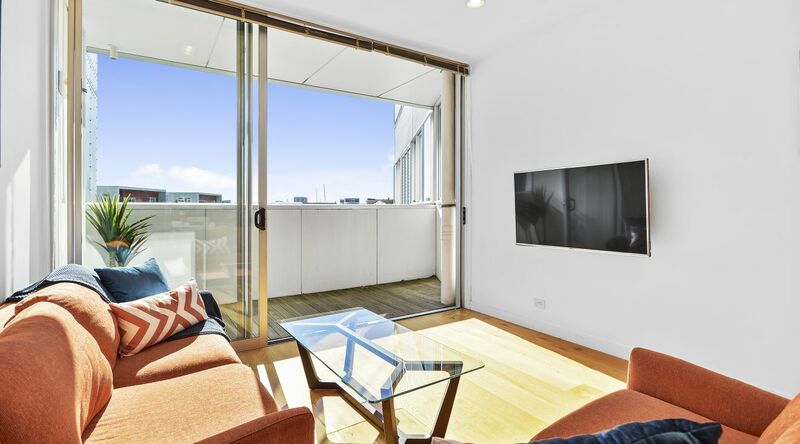 This apartment is located in the award winning Beaumont Quarter and has a north facing sunny open plan living area & kitchen, 1 bedroom, 1 bathroom and a carpark with convenient lift access to your door. Unlike many of the shoebox apartments in the CBD, our place has 59 m² floor area (similar to some two bedroom apartments). This means we have space for a full lounge suite, a six seater dining table and a kitchen that you won't feel cramped in. 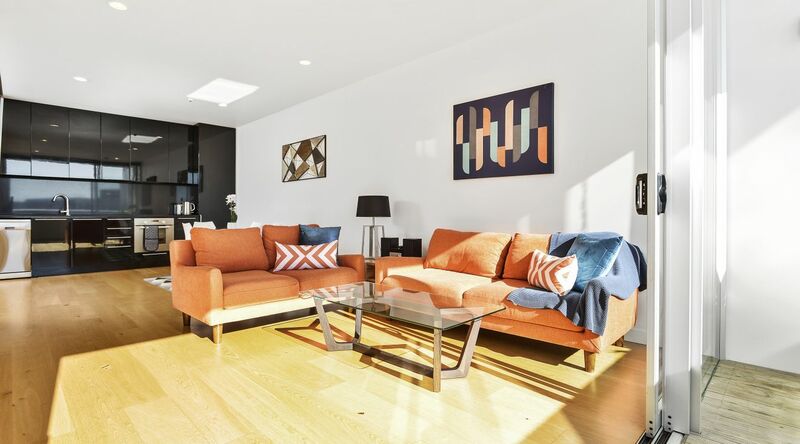 The apartment has been recently renovated and furnished to a very high standard with modern contemporary furniture. High ceilings and an abundance of natural light through the north-facing floor-to-ceiling ranch sliders make this a light and airy, spacious apartment. Guests frequently mention in reviews about how comfortable the Sleepmaker Posture Align bed is when combined with the high thread count sheets and the wool all-seasons duvet. Lisa from Mangawhai said "The beds were fantastic. Just bliss when you put your head on the pillow and snuggled in those luxurious linens. I have to say this because so often in NZ those that rent private accommodation do not make this a priority." Sit back and relax in style on the comfortable sofas while watching Netflix on the 49" 4K Smart TV or listening to some music on the stereo system (Bluetooth, CD player or radio). The wifi is connected to an unlimited high-speed 100 Mbps fibre internet connection. The bed is super king size, which gives you and your partner plenty of space. We can also split the bed into two long single beds (203cm long x 91cm wide) which can provide an option for good friends. Beds come with wool all-seasons duvets, high thread count sheets and a selection of soft, medium, hard and feather pillows. There is a large chest of drawers and the large closets are stocked with clothes hangers. You can continue watching your Netflix in the bedroom on the wall mounted HD Smart TV. Free secure parking for one car is provided in a space located below the apartment building. There is direct access to the apartment via a small flight of stairs and a lift (you need to able to climb up 5 steps).